More options ? Filter all! Give your home a handmade Easter touch with our sweet, free patterns! Go to original pattern for design DROPS 80-10. This pattern still doesn't have a name. Suggest one! DROPS 5 mm [US 8] and 5.5 mm [US 9] circular needles, or sizes needed to obtain correct gauge. Not sure which size you should choose? Then it might help you to know that the model in the picture is approx. 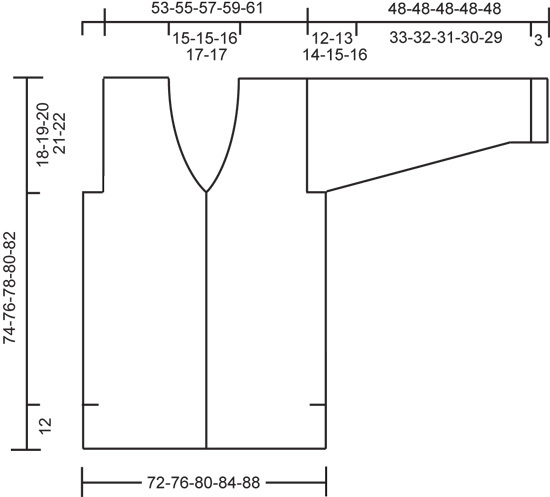 5 ft 7 in and uses size S or M. If you are making a sweater, cardigan, dress or similar garment, you will find a graphic with the measurements of the finished garment (in cm) at the bottom of the pattern. NOTE: This pattern is written in American English. All measurements in charts are in cm. For conversion from inches to cm - click here. There are different terms for crocheting in American and British English. If this pattern includes crochet, click for "crochet terms" here. For this pattern in British English, please click here. 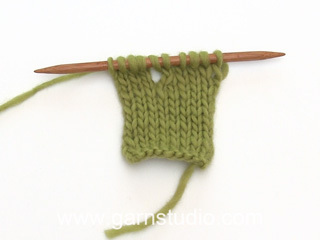 Gauge: 15 sts x 21 rows on larger needles with 1 strand Silke-Tweed + 1 strand Vivaldi = 10 x 10 cm. Rib: * K 2, P 2 *, repeat from * - *. Combination A: 1 strand brown Silke-Tweed + 1 strand Vivaldi. Combination B: 1 strand flint Silke-Tweed + 1 strand Vivaldi. Combination C: 1 strand beige Silke-Tweed + 1 strand Vivaldi. Combination D: 1 strand natural Silke-Tweed + 1 strand Vivaldi. * color A for 4 cm, color B for 4 cm, color C for 6 cm, color D for 4 cm, color B for 3 cm, color A for 2 cm, color D for 5 cm *, repeat from * - * to finished measurements. Color A for 5 cm, color B for 4 cm, color C for 3 cm, color D for 2 cm, color B for 2 cm, color C for 2 cm, color B for 3 cm, color A for 4 cm, color C for 2 cm, color B for 6 cm, color A for 5 cm, color B for 4 cm and color C to finished measurements. Back: Cast on 108-114-120-126-132 sts on smaller needles with 1 strand brown Silke-Tweed + 1 strand Vivaldi and knit 4 rows garter st. Change to larger needles and knit Stripe Pattern-body – see instructions above – keeping 4 sts at each side in garter st for edge of split. When the piece measures 12 cm end split and cast on 1 new st at each side (= edge st for seam allowance) = 110-116-122-128-134 sts. Continue in reverse stockinette st. When the piece measures 56-57-58-59-60 cm bind off 15-17-18-20-21 sts at each side for armhole = 80-82-86-88-92 sts. When the piece measures 72-74-76-78-80 cm bind off the center 18-18-20-22-22 sts for the neck. Then bind off 2 sts at each neck edge on the next row = 29-30-31-31-33 sts remain on each shoulder. Bind off when the piece measures 74-76-78-80-82 cm. Left front: Cast on 55-58-61-64-67 sts on smaller needles with 1 strand brown Silke-Tweed + 1 strand Vivaldi. Knit 4 rows garter st, change to larger needles and knit Stripe Pattern as on back, keeping 4 sts in garter st at the side edge for edge of split. When the piece measures 12 cm end split and cast on 1 new st at the side edge (edge st for seam allowance) = 56-59-62-65-68 sts. Continue in reverse stockinette st over all sts. When the piece measures 56-57-58-59-60 cm bind off for armhole at the side edge as on back = 41-42-44-45-47 sts. When the piece measures 56-58-60-60-62 cm dec 1 st at the center front edge for V-neck every other row 9-9-10-11-11 times and then every 4 rows 3 times = 29-30-31-31-33 sts remain on shoulder. Bind off when the piece measures 74-76-78-80-82 cm. 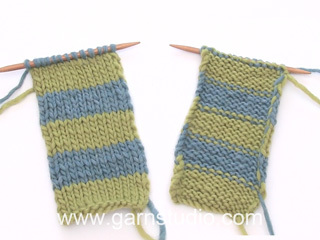 Right front: Cast on and knit the same as the left reversing shaping. Sleeve: Cast on 38-42-42-46-46 sts on smaller needles with 1 strand flint Silke-Tweed + 1 strand Vivaldi and knit rib for 3 cm, keeping 1 st at each side in garter st. Change to larger needles and Stripe Pattern-sleeve in reverse stockinette – see instructions above. When the piece measures 10 cm inc 1 st at each side every 4-3.5-3-3-2.5 cm a total of 7-7-8-8-9 times = 52-56-58-62-64 sts. When sleeve measures 36-35-34-33-32 cm put a marker at each side (to mark where the sleeves will go into armhole). When the piece measures 46 cm bind off for sleeve cap: 5 sts at each side every other row 2 times, then bind off the remaining sts. The piece measures approx. 48 cm. Row 1 (wrong side): K 2 (edge sts knit in garter st), * P 2, K 2 *, repeat from * - * and finish with P 2 . Row 2 (right side): K 2, * K 2, P 2 *, repeat from * *, finish with K 2 (edge sts knit in garter st). When the rib measures 3 cm bind off all sts in rib. Repeat along right button band, but after 1 cm make 6 buttonholes evenly distributed. The bottom buttonhole should be approx. 20 cm from bottom edge and the top buttonhole approx. 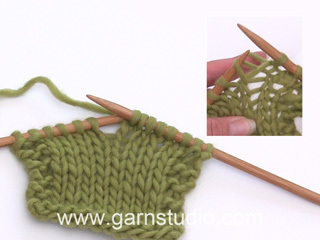 1 cm from beginning of neck shaping (1 buttonhole = bind off 1 st and yo. 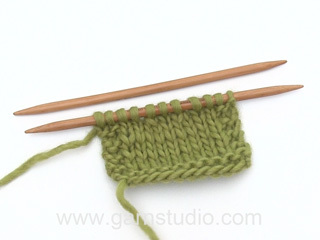 On the next row twist and knit the yo so the buttonhole will not stretch out). Neckband: Pick up approx. 92-110 sts around the neck (incl. over buttonbands) on smaller needles with 1 strand flint Silke-Tweed +1 strand Vivaldi. K 1 row from wrong side and K 1 row from right side, then K and bind off all sts with from wrong side. Sew in sleeves – put the sleeves in so the marker meets up at side edge of Body. Sew sleeve and side seams using edge sts as a seam allowance down to the top of the split at each side. Sew on buttons. Scarf: See pattern under Model 3. All measurements in charts are in cm. Die Garne "Silke-Tweed" und "Vivaldi" sollen ausverkauft sein. Haben Sie eine Empfehlung für Ersatz? Ich hätte gern genau die gleichen Farben, gute Trageeigenschaften und möglichst Waschmaschinen geeignet. Welche Mengen muss ich wo bestellen zu welchen Kosten? Vielen Dank! E.L.
Liebe Frau Lindner, gerne können Sie unseren Garnumrechner benutzen, um die Alternative zu Silke Tweed und Vivaldi zu schauen. Gerne wird Ihnen Ihr DROPS Laden damit helfen, die passenden Farben zu finden - auch telefonisch oder per E-mail. Wenn Sie keinen Laden in Ihrem Gebiet haben, schauen Sie die Kostenbedingungen auf den unterschiedlichen Onlineshop. Viel Spaß beim stricken! With over 30 years in knitting and crochet design, DROPS Design offers one of the most extensive collections of free patterns on the internet - translated to 17 languages. As of today we count 242 catalogs and 8795 patterns - 7734 of which are translated into English (US/in).